How gymnastics coaches should teach kips | Swing Big! So I was going through my posts last night, and it seemed kind of funny to me that there weren’t more posts on kips. It’s something almost every coach struggles with. Even if you are GREAT at teaching kips, and your kids have all the strength in the world, it’s a hard skill for kids to master. The timing of it is funny, the strength required for it may not be there, the shapes may need reinforcement etc. At some point in time I have heard almost every coach I have ever worked with say “I wish she would just make her kip already.” It’s a common sentiment in the gym world. 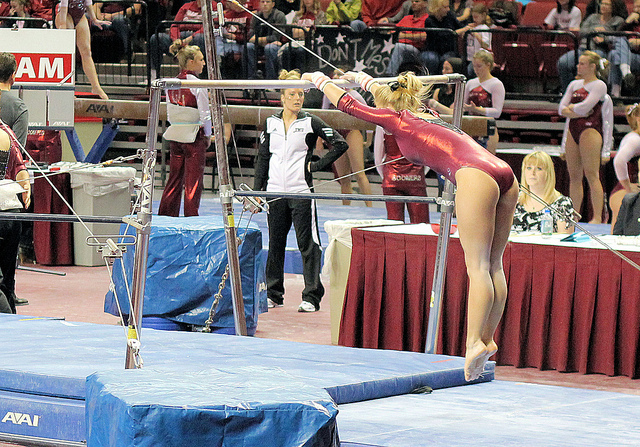 It’s such a fundamental skill on bars. So I thought I would share some videos about it today. Oh, by the way I have already shared two really phenomenal videos in a previous post by Jason Mortimer. This first video has SO MANY kip drills and conditioning exercises. The stuff the gymnast is going at the beginning (jumping and pushing on the wall/bar in a hollow shape) is one of the first things I do with my kids when teach kips. The glide is SO important to the development of the kip that it’s worth it to get those shapes right early. This second video is of Tony Retrosi and four really productive drills. I normally set up stem-kips on a block or on P-bars if they are available. I think something a little closer than how his bars are set is necessary. I like for the kid to be able to keep their foot on the bottom mat, if only just barely. Short kips I tend to like from horizontal better than from something where their feet are hanging too far down.